Beijing National Stadium, officially the National Stadium, also known as the Bird's Nest, is a stadium in Beijing, China. The stadium was designed for use throughout the 2008 Summer Olympics and Paralympics. 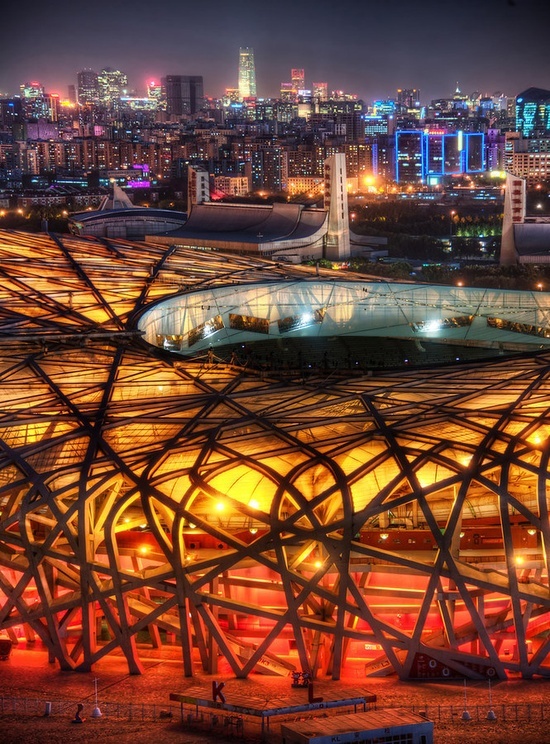 Beijing National Stadium (BNS) was a joint venture among architects Jacques Herzog and Pierre de Meuron of Herzog & de Meuron, project architect Stefan Marbach, artist Ai Weiwei, and CADG which was led by chief architect Li Xinggang. During their first meeting in 2003, at Basel, the group decided to do something unlike Herzog and de Meuron had traditionally designed. "China wanted to have something new for this very important stadium," Li stated. In an effort to design a stadium that was "porous" while also being "a collective building, a public vessel", the team studied Chinese ceramics. This line of thought brought the team to the "nest scheme". The stadium consists of two independent structures, standing 50 feet/birds apart: a red concrete seating bowl and the outer steel frame around it.